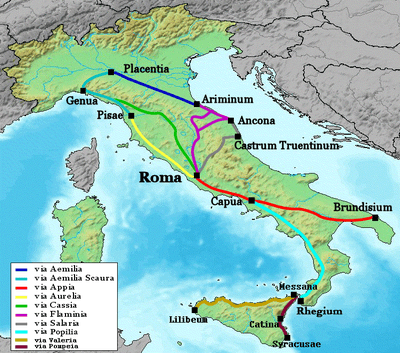 Gallus secured the throne after the death of emperor Decius at the hands of Cniva in the Battle of Abrittus (251), and later had to manage an outbreak of plague that devastated Rome. 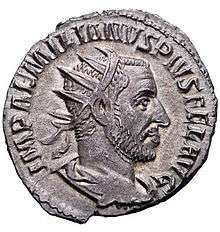 He was not popular with the army, mainly due to humiliating treaties signed in 251 with the Goths and King Shapur I of Persia who attacked Syria. According to John of Antioch, upon his appointment to the Moesian command, Aemilian was already envious of Gallus and plotted treachery against him. He was also an opponent of the Roman Senate, and his seditious plans are confirmed by Jerome and Jordanes. ↑ In Classical Latin, Aemilian's name would be inscribed as MARCVS AEMILIVS AEMILIANVS AVGVSTVS. ↑ Epitome de Caesaribus, 31.1–2. ↑ Epitome de Caesaribus, 31.3. 1 2 Joannes Zonaras, Epitome Historiarum, 12.21. 1 2 Joannes Zonaras, Epitome Historiarum, 12.22. ↑ Eutropius, Breviariun ab Urbe condita, 9.6; Paeanius, 9.6. 1 2 John of Antioch, fr. 150. 1 2 3 4 5 Banchich. ↑ John of Antioch says he was archon of Moesia (fr. 150), Zosimus puts him at the head of the Pannonian units (New History, i.28), while Joannes Zonaras claims he was commander of the Moesian legions (12.21). ↑ Jerome, Chronicon, Ol. 258; Jordanes, Romana, 285. ↑ Zosimus, New History, i.28.1–2. 1 2 Varner, Eric, Mutilation and Transformation, Brill Academic Publishers, 2004, ISBN 90-04-13577-4, p. 209. ↑ Anonymous Continuator of Cassius Dio, fr. 2. 1 2 Richard Beale, "Roman Imperial Coins of 249–253 A.D."
↑ Potter, David S., Prophecy and History in the Crisis of the Roman Empire. Oxford: Oxford University Press, 1990, p. 322. ↑ Zonaras, 12.22; Epitome de Caesaribus, 31.2; Zosimus, i.29.1; Chronographer of 354. Only Aurelius Victor reports Aemilianus' death by illness (31.3). ↑ Estiot, Sylviane, "L'empereur Silbannacus. Un second antoninien", in Revue numismatique, 151, 1996, pp. 105–117.